Live from DEF CON 26 Aug 10-12. Music for Hacking. DEF CON is one of the world's largest annual hacker conventions, held every year in Las Vegas, Nevada. Since 2013, SomaFM has provided the music for the DEF CON Chill room. That theme continues with SomaFM broadcasting this special year-round stream from San Francisco, hosted by the DJs who entertain the DEF CON 26 chill room this year in Vegas. Here is more information on the DEF CON speaker drop-ins we play between songs. 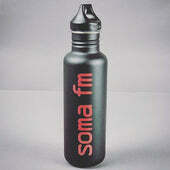 SomaFM water bottle by Klean Kanteen, keeping you hydrated and BPA-free! In stealth matte black with the SomaFM logo in red. Get yours with a $60 (plus postage) donation.